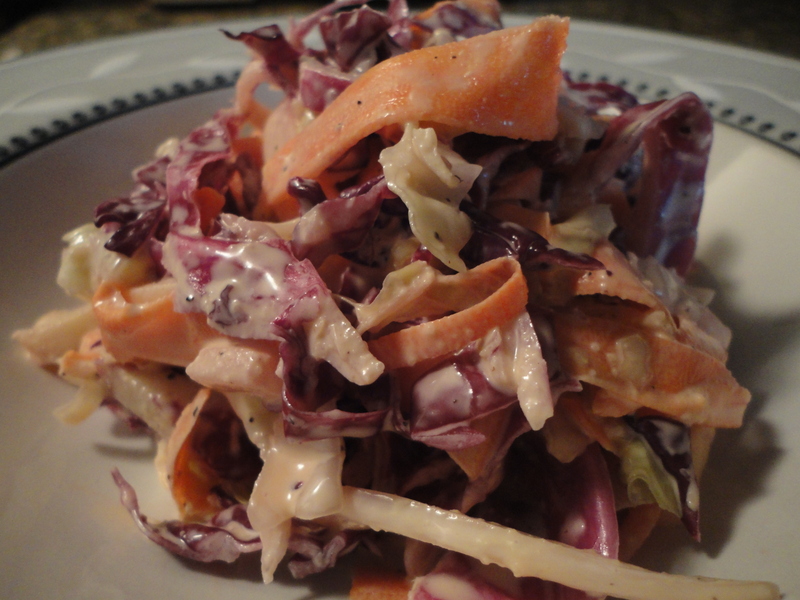 My famous slaw… get ready for summer! So the weather is finally getting warmer (or so they say) and grills are starting to fire up. What better side dish is there for BBQ than homemade coleslaw!? I started making this dish last year, and it was a HUGE hit with friends, family and strangers alike. It was requested for every party I attended for the rest of the summer. Note: The slaw can be made the day prior, but I recommend making it the day of so the cabbage and apple retain their crispness. You might be wondering what I mean when I say to “ribbon” the carrots. Very simple, peel them, then use the peeler to slice the carrots along their length to create ribbons, periodically rotating the carrot so you do not have ribbons that are the full width of the carrot. Or if you have a mandolin you can use a large julienne setting to achieve this. Combine the cabbage, carrot and apple in a mixing bowl. Add the mayonnaise, salt, pepper, garlic powder and granulated sugar to the bowl. Using a zester, microplane or fine cheese grater zest the entire exterior of the lemon into the mixture, then cut the lemon in half and squeeze both halves into the bowl, using a strainer or your cupped hand to prevent seeds from getting into the salad. Mix thoroughly. Taste the slaw to check preference on salt and pepper, add more if desired. Allow to cool in refridgerator before serving. So that’s my slaw, I hope you like it! Tags: coleslaw, homemade coleslaw, homemade slaw, slaw. Bookmark the permalink.